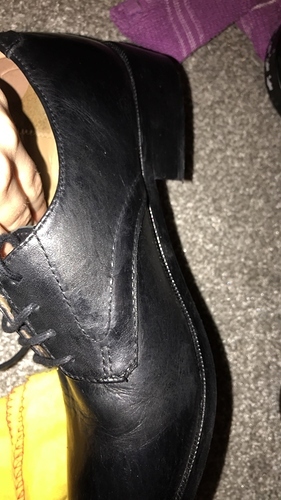 Hi i was wondering if anyone has any tips for polishing shoes, the polish keeps falling off and they aren’t shiny enough even tho i put hours of effort into them? any tips? Are they cheap shoes? I’ve seen people with cheap (ish) shoes that won’t polish very well. What polish are you using and how do you polish them? There are lots and lots and lots of threads on polishing. You’d be better searching for them first. You should still be able to get a half decent shine on them. Firstly, i’d make sure your cloth is soft, ideally a polishing cloth. Alternatively, use cotton wool. Polishing works differently for every person, but personally i’d skip the waiting 30 minutes and just keep doing small circles until it’s completely rubbed into the leather. Repeat until it shines well. As you get a decent shine gradually reduce the polish so it rubs in quicker, this will shine the shoe better. If you could upload a picture it might be helpful, especially if it’s in the one area as you say. It’s normal to flake off in the creases when you walk. Try the technique I posted above, that should hopefully help. Focus on the toe area firstly to find if your technique works then do the rest of the shoe. Got to ask, have you ever used instant shine products on your shoe (don’t if you haven’t)? what’s an example of instant shine? parade gloss? That’s why you have to use the right kind of paint. Or flexane, if you can still get it. Maybe if they use poster paint! The best kind of paint! Hi, I had the same problem, but I just kept working on them, as I was spending hours, and not getting any result. There are ‘pores’ in the leather, and it will take time to fill them in, and then after that you should see a good shine. Hope this helps as that is what I have done, and it worked for me!